The state of Victoria is experiencing a particularly steep decline in average autumn rainfall, with a 40 per cent decline recorded since 1950 (25 % in South-East Australia as a whole). CSIRO climate scientist Dr Wenju Cai and colleagues have reported that this seems to be connected to rising sea level atmopheric pressure and a a decrease in alternating high and low pressure systems — with connections to climate change. In brief, the mean annual (autumn) rainfall over the twelve-and-a-half year period Oct 96 — May 09 was 504 (100) mm, which is drier than extreme drought of Jan 35 — Aug 47, which averaged 512 (121) mm. For reference, the average over the entire 1900 — 2009 period is 567 (132) mm. Aside from the autumn decline noted above, a drying trend in spring is now emerging, with spring rainfall below the long term average 6 times during the last 7 years (2002-2008). There is a strong association of these conditions with the intensification of the sub-tropical ridge (STR), which may in turn be linked to the wetting trend and polewards expansion of tropical weather systems and Hadley circulation — a phenomenon predicted by global climate models to occur at a far slower rate than is being observed. The long-term rainfall deficiency since October 1996 across South Eastern Australia (SEA, south of 33.5ºS and east of 135.5ºE) documented by MT08 [Murphy, B. and B. Timbal, 2008: A review of recent climate variability and climate change in south-eastern Australia, Int J Climatol, 28(7), 859-879] was described as being severe but not unprecedented in the instrumental record. With an additional 3 years of below average rainfall, that statement is no longer true. The recent 12 year, 8 month period is the driest in the 110 years long record, surpassing the previous driest period during WWII [World War II]. The spatial extent of the deficiency covers most of the south-western part of eastern Australia and extends along significant orographic features eastward and northward. The seasonal signature of the rainfall decline has also evolved. It remains dominated by a strong and highly significant autumn rainfall decline, but has been supplemented by recent declines in spring, particularly after 2002. The spring decline is the dominant feature of the very dry 2006-2008 period. This change in the relative contributions by the autumn and spring seasons now more closely resembles the picture provided by climate model simulations of future changes due to enhanced greenhouse gases. However, the growing magnitude of the rainfall decline is far more severe than any of the IPCC-AR4 model projections except for the lowest deciles from the model uncertainty range, forced with the highest emission scenarios occurring later in the 21st century (2050 to 2070) (CSIRO and Bureau of Meteorology, 2007). The most important characteristics of the ongoing rainfall decline (spatial extension, intensification and change in seasonality) are well aligned with the recent evolution of the STR and its known influence on SEA rainfall. Other largescale influences were briefly evaluated. It appears unlikely that the ENSO [El Niño Southern Oscillation] mode of variability has contributed to the worsening of the rainfall decline in the last 3 years. On the contrary, it appears likely that the Indian Ocean mode of variability (with three positive IODs [Indian Ocean Dipole] in a row) may be linked to the strong spring signal in 2006-2008. However, that does not change the fact that the IOD is unlikely to be responsible for the largest component of the rainfall decline (the autumn part) and based on the limited evidence provided here, it is unclear whether the IOD is a contributor, or simply a covarying response to other factors. Finally, the long-term evolution of the SAM [Southern Annular Mode] remains unlikely to explain the longterm decline in SEA due to the seasonal nature of the influence of SAM on SEA rainfall but its role (both positive or negative) is visible while updating month by month anomalies. You can download the full paper as a PDF here. It’s 8 pages long, and includes some highly informative statistics, analysis and revealing colour figures. I strongly suggest you take the time to read through it, if you wish to have a well-grounded scientific understanding of the worrying rainfall deficits that this part of the world is now experiencing. The problems for food production keep piling up. Reduced winter rainfall, looming shortages of tractor diesel and ammonia based fertiliser and unhelpful humid conditions at harvest time. If the RET can be interpreted as 5 GW average renewable power by 2020 I’d expect a dozen large desal plants to be drawing that power on their own. Desalinated water at $2+ per kL will be far too expensive to grow food. I think farming will have to become more localised and water efficient eg suburban hydroponic farms. Forget population growth unless it is the tropical north. Meanwhile the southern cities will remain in denial they have grown too large. The first not only makes carbon-free electricity, but can be made to function as an artificial “super-tree” to provide humidity, cloud-cover. In Almeria, Spain, (arid) greenhouses have reduced the local temperature by 0.3 C, while the rest of Spain has seen its temperature increase by 0.6 C. They’ve been using groundwater for this, and must switch to sea water. It can be done with the help of the Vortex-assisted updrafts tied to connection ducts leaving the greenhouses. So to put this into perspective, the present drought in SE Australia (mainly Victoria) received 1.5% less rainfall than the Jan 39 – Aug 47 (WW11 drought). This was when CO2 levels were around 300-310ppm as opposed to 370-390 in the past decade. So a rise of say 80ppm leads to 8mm drop in yearly average rainfall. Yet when CO2 levels were around 330ppm in the 1970s, there was increased rainfall (probably even more in the 50’s). 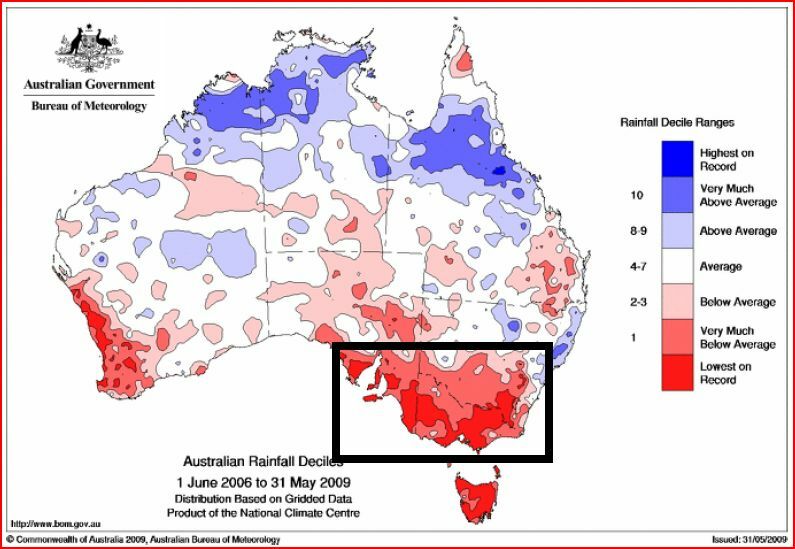 And the Federation drought brought very little rainfall to all parts of eastern Australia when temps and CO2 levels were much lower. Are you sure that there is not something else going on here? Others with far more expertise are better placed to comment, but clearly the SE Australian drought is not a direct result of changes in the CO2 level. If it were, the whole planet would presumably be undergoing a similar pattern of change, which is not the case. In fact, the big picture is that global precipitation rises with increases in global temperatures. However, regional effects are generally much more significant than global trends, and the changes described in the article are due to shifts in climate systems (ENSO, the poleward migration of tropical regions, and so on). Precipitation levels and rainfall patterns are influenced by many factors. To look simply at CO2 levels in a system as complex as climate, especially on a regional scale, is to miss the real picture. The earlier periods you mention at the start of the 20th century and around WWII had significantly lower temperatures than today; and the various climatic features of the region have begun to shift as a result of ocean temperature rises in particular, as well as other factors such as the changes in wind patterns around the Antarctic, etc etc. Climate ain’t simple. Climate models — based on physical science — do not predict planetary-wide drying. They predict an overall wettening of the planet, with drying around the Mediterranean regions — just as is being observed. This is a straw man. “Precipitation levels and rainfall patterns are influenced by many factors. To look simply at CO2 levels in a system as complex as climate, especially on a regional scale, is to miss the real picture. Did you read and understand the linked paper by Timbal, or the IPCC chapters on this topic? If so, you will see careful explanation of the many factors that ARE indeed being considered, and note that it is not simply looking at CO2. Another straw man. Matt, I suggest you study the reference paper a little more carefully. Yes, more is going on. Read the Timbal paper, or the post above, and you’ll see that other things are indeed discussed. Climate change can load dice without needing to create new phenomenon (though it can do that too). You, and others, are creating straw man statements, when you should know better — if you were trying to think scientifically, instead of ideologically. Whoops! I seem to have expressed myself in a very unclear way. Apologies. I’m completely in agreement with all that, Barry – in fact I was trying to argue exactly the same thing, in response to Ian George’s post about precipitation patterns compared to CO2 levels. For instance, when I said “clearly the SE Australian drought is not a direct result of changes in the CO2 level” I meant that it’s not a direct physical response to 390ppm or whatever of CO2 in the atmosphere, it’s a response to all the other changes in the climate system, such as temperature rises, circulation changes, etc, which are happening as a result of the CO2 increase (and many other forcings, of course). Does anyone know what the inflows for the MDB have been since 2005? Or have a link? I have been looking at this issue over the last little while. Examining 5-year averages of global temperature anomalies and comparing those to 5-year averages of annual rainfall, a surprisingly close negative correlation emerges in the period starting with the 5-year average ending 1990. The R^2 value is around 85. The slope of the line is around -4.80 mm per .01 degree centigrade. (I should point out that obviously this trend has not covered one full degree centigrade rise in global temperature anomaly – it only covers a .3 degree rise). If this trend continues for .6 degrees, the system will come close to meeting the technical definition of a desert. Oops: I should clarify that the rainfall discussed in the above is Victorian rainfall. Use the Murray Darling Basin Authority website,Ian. 12000 km desalinatIon drains made in WEST AUSTRALIA WHEAT BELT – Connection desalination drain to sea not constructed yet. It would be interesting to see huge improvement when connection desalination drain to sea is made.